This beautiful girl is the girl that Henry intends to marry. He talks about her ALL...THE...TIME. No joke. When he prays (at night or before meals) it always starts off with "Dear Jesus, thank you for Isabella and...." (Don't worry Andi, Lexi is always in there too!) We see her a few times a week (twice at preschool and usually at least once for a play-date and often at Sunday school) and it is never enough. At the dinner table the other day Henry told us that when he thinks about Isabella his "heart just cracks, because I love her so much!" Where does a four year old even come up with words like that? My future daughter-in-law's mom has also started a blog. She only has one post up so far, but I'm sure she'll be a blogging-addict in no time. If you want to stop by her site, it is The I's Have It!. I'm sure she'd love to have a few visitors! Bridget wanted me to show you all her very favorite summer dress, since she is going to be crawling soon and won't be able to wear it as often. All you parents of little girls probably already know this, but it seems that: cute little dress + crawling baby = frustrated baby getting caught up in dress. Happy Thursday! Hope you have a great day! We had Jon and Kelly over for cards last night. We popped some popcorn and Jon made his way over to the fridge for some lemonade. He turned back toward the table holding a completely empty pitcher that he had just pulled out of the fridge. And Sam says, "Oh, I'm sorry, Jon. I left that in there for Lisa to find." Yep. I've always wanted to think the best of Sam. I try to give him the benefit of the doubt and assume that he probably didn't realize that the pitcher was completely empty before putting it back in the refrigerator. But now I know the truth! Bridget's tooth! And she had a second one come in this last week too. It's right beside the first one (front and center, bottom). I realize you probably can't see it in the picture, but I wanted to show y'all how cooperative she was being in showing her teeth for pictures! :) Here's the progress on our house! Great, huh? We were so excited to see that they have started the second level. I'm sure this week will be incredible to watch! Sam taught Jonah how to flip me off at soccer on Saturday. Ha! Actually Jonah was just fooling around with his hands and came up with this. He showed Sam and Sam told him, "Let Mommy take a picture of your hand!" Sam dressed Bridget for the early morning soccer game. The outfit he picked was great. The funny part was that he found it to be cold enough for her to wear a hat, but warm enough for her to wear a short sleeved t-shirt. Cracked me up! And I'll finish with just a cute picture of my boys at the new house! It really was a fun weekend...Sam wasn't traveling and we really enjoyed having him around. He got to be at Henry's soccer game and church (two things I usually attend alone) and we had a date night with a new couple and we even had lunch at a friend's house after church on Sunday. Good times! 3. Link to the person that tagged you in your post and to the original post if possible so we can track it as it travels across the blogosphere. Life is more fun with friends! At the house we live in now we have a whole backyard full of pine trees, but only two really big ones. When the builder cleared the lot, they left the back 1/4 of the lot fully wooded. Then they took out almost all of the rest, except for two HUGE pines that sort of anchor our backyard (one on each side right in the middle of the grass). Sam was looking at one of these trees last week and noticed that in a scraped up area near the bottom there were about a million ANTS! They had found a weak spot in the tree and moved themselves on in, destroying the tree from the inside out. There were two challenges in taking down this tree. 2. Not having any part of the tree land on the house or the shop. Sam was succesful in both of the challenges. He invited his dad to help him and earlier this week they cut down the tree. I didn't take many pictures after the one below because I was trying to keep my children safely inside the house. But look closely....you'll see that Sam has crawled up into the tree (with his chainsaw! ), way past the top of the ladder, to remove the top part first. That was the hardest part and once it was down the rest went pretty quickly. Thank you Lord for keeping my husband safe in all that he does!!!! Sam was out of town this past weekend. I volunteer to work in the church childcare every other Sunday, and this weekend was one of mine. I work during the later service so I try to get to the early service so I don't have to miss church. I got up early Sunday morning and got myself ready. Then I got the boys breakfast, got Bridget nursed and fed her cereal, everyone dressed, made sure everyone's teeth were brushed, and had everyone go potty. I even had time to enjoy a cup of coffee while dashing around getting everything done. I was feeling pretty proud of myself. At 9:27 we pulled into the parking lot, and since church starts at 9:30 we were right on time. Again, I'm patting myself on the back. Henry hopped out of the van, chattering about who he was going to see in class today. I unbuckled Bridget and grabbed her diaper bag, then turned to see why Jonah wasn't out of the van yet. At the same time, Henry leans back into the van, looks at Jonah and says, "Joe, why don't you have any shoes or socks on?" You might wonder how I wouldn't notice this? Well, I was too busy patting myself on the back for getting my family to church on time to see that my three year old wasn't wearing any shoes! Pride had reared it's ugly head. These pictures are from Friday's story time at the local library. Yes, the library. I LOVE living in a small town! 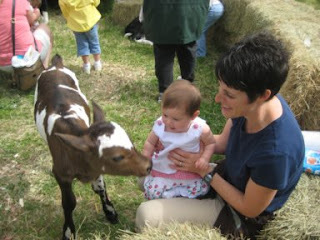 The library here has an annual event where they bring cows and calves for kids to touch and feed. They supplied these HUGE bottles and let the kids give the calves milk--it was too cute. Henry had fun feeding a calf and petting them all. Jonah didn't want any part of feeding them, but he enjoyed petting them and running around in their trailer. Bridget thought it was really exciting. She kept grabbing handfuls of the cow's hair (or it's ears!) and then laughing very hard. By the way, the calves in the pictures above were three days old. They're pretty big, huh? Thankfully, this was all happening outside the library. Inside the library, the kids were treated to a cute story and then snacks and craft time. The people that run the dairy brought different kinds of cheese, chocolate milk and oreos for the kids and they also passed out goody bags to all the kids and had t-shirts as door prizes. Then the kids had the chance to decorate card-stock cows (or chickens, for some reason) with all sorts of fun textiles (feathers, cotton balls, googly eyes, scrunchy paper, etc...). 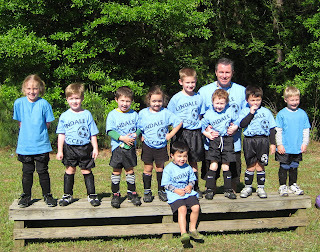 Today (Saturday), we started the morning off with Henry's soccer game. What fun! It really seemed like the kids were all having fun and they knew what they were doing today. And the entire team was there too, which is an unusual occurance! After the soccer game today we had a good friend's birthday party to attend. It was held at a great place that has a skating rink and inflatable bounce houses (some inside and some outside). Henry has been telling me all week how he COULDN'T WAIT to "skate on the ice" instead of just the carpet. The ice is, of course, the skating rink. :) We have been to this place before and Henry prefers to stick to the carpeted areas. The carpeted areas slow down the skates, making it easier for him to stay on his feet. He did really well! After trying out "the ice" Henry decided maybe he would just stick to the carpet after all. He didn't even want to hold my hand, preferring instead to shuffling along by himself. I was so proud of that little guy! Have I mentioned our neighbors at the new property? The people that live right next door have a whole bunch of kids. The two youngest are maybe 11 and 12. Every time we are out at the property, they come running over to talk to us and then ask if the boys can play. They are the nicest kids, and they just come over specifically to see the boys. They are always polite, and they have incredible amounts of patience with my children. Oh, and speaking of the property....there has been progress! Check it out! This is the wood that will make up our new home! Look who found her legs! Bridget recently figured out that her legs work for something other than bringing her toes to her mouth. :) She LOVES to stand....so much so that she won't bend her legs for me to sit her down on the floor. She has pulled herself up (using my shirt) to standing a few times already--go, Bridget! Here's her fan club. See how they're encouraging her.....aren't they great big brothers? Here's a picture of Bridget with her Granddad. I love seeing my kids with their grandpop. I didn't ever have a chance to know either of my grandfathers--they both died when I was very young. So it is especially sweet for me to see my kids with their grandfather--and Bridget and Granddad seem to have a great bond! Today is my wonderful, handsome, funny, cute, strong, silly, smart, sweet, caring, lovable, thoughtful and imaginative husband's birthday. To know Sam is to love him. Sam makes life fun! I love being married to this guy. I never know what he is going to do or say, and that is part of his charm. Sam always keeps things light-hearted and he has such a wonderful way with our kids....maybe because he is still a kid at heart! I love you, Sam! Have a happy Birthday! Keep your kisses to yourself, Henry! My kids love to "love on" each other. There are always lots of hugs, kisses, tackles, pats, and other physical shows of affection at our house. The boys especially love to kiss on Bridget. Usually, that is a great thing. Usually, one of my kids doesn't have strep throat and impetigo (a highly contagious blistery rash, caused by the strep throat) and I don't have to worry about sharing germs! Hopefully things will be back to normal soon and only ONE of my children will have had this illness. This is why I have to wash my WALLS! Bridget's first tooth erupted yesterday! She is eight months and two days old. :) It's so cute, but there will be no picture at this point. It's just the teeny tiniest little white point. She had a runny nose all day yesterday so I was pretty sure she was working on something, and sure enough....there it was! I'm a secret blogger. Besides my family (including my sister-in-law,--who got me started on blogging, but now doesn't seem to post anymore--Beth) none of my local friends knows that I blog. It's not that it is a secret, exactly, it's just that I haven't shared it. Or I haven't thought they would be interested. Or maybe I just like to compartmentalize my life (here are my 'real life' friends, over there are my blogging friends, and so on....). The reasons don't matter so much. My point is that I recently told two of my friends about my blog. And they wanted to read it. One of them has even started her own blog (go, Andrea!) and the other has tried a few recipes off of my recipe blog. And a question for you who are reading this blog....Do your 'real life' friends know about your blog?